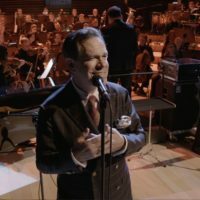 Grammy winner Kurt Elling, according to The New York Times, one of the most outstanding singers of our time, performs with the National Polish Radio Symphony Orchestra in Katowice. It’s the only concert in the country, during the 20th edition of the LOTOS Jazz Festival Bielska Jazz Zadymki. Elling, known for his technical mastery and emotional depth of a rich, four-octave baritone voice, is famous for expanding the possibilities of jazz vocalism, making him one of the most popular performers of modern jazz. Performing with his quartet and a dozen or so NOSPR band members conducted by Alexandra Humali, the program includes pieces from his latest albums, modern interpretations of jazz standards and, of course, improvisations.